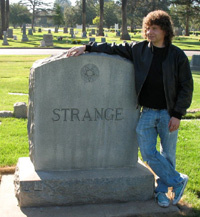 Michael Scott Bricker has sold science fiction, fantasy, and horror stories to several anthologies, including Blood Muse, Whitley Strieber’s Aliens, After Shocks, Timelines, and War of the Worlds: Frontlines. His first professional sale was to Young Blood, a horror anthology featuring authors who were under thirty at the time of publication. Mike is also an active member of the Horror Writers Association. Mike graduated from UC Irvine with a degree in English and also attended the Clarion Science Fiction Writers’ Workshop. He has worked around books for most of his adult life, having been employed by numerous bookstores and libraries. For the past twelve years, he has worked for OC Public Libraries in Irvine.